The terrorist attacks of September 11, 2001 reopened what many people in America had long assumed was a settled ethical question: Is torture ever morally permissible? Within days, some began to suggest that, in these new circumstances, the new answer was yes. Rebecca Gordon argues that September 11 did not, as some have said, change everything, and that institutionalized state torture remains as wrong today as it was on the day before those terrible attacks. Furthermore, U.S. practices during the war on terror are rooted in a history that began long before September 11, a history that includes both support for torture regimes abroad and the use of torture in American jails and prisons.The terrorist attacks of September 11, 2001 reopened what Gordon argues that the most common ethical approaches to tortureutilitarianism and deontology (ethics based on adherence to duty)do not provide sufficient theoretical purchase on the problem. 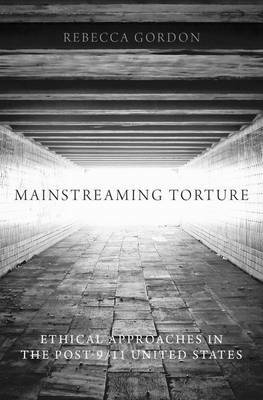 Both approaches treat torture as a series of isolated actions that arise in moments of extremity, rather than as an ongoing, historically and socially embedded practice. She advocates instead a virtue ethics approach, based in part on the work of Alasdair MacIntyre. Such an approach better illumines tortures ethical dimensions, taking into account the implications of torture for human virtue and flourishing. An examination of torture's effect on the four cardinal virtuescourage, temperance, justice, and prudence (or practical reason)suggests specific ways in which each of these are deformed in a society that countenances torture.many people in America had long assumed was a settled Mainstreaming Torture concludes with the observation that if the United States is to come to terms with its involvement in institutionalized state torture, there must be a full and official accounting of what has been done, and those responsible at the highest levels must be held accountable.